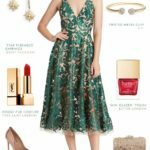 This post was originally written in 2018, but the shop section has been updated with picks for June 2018! 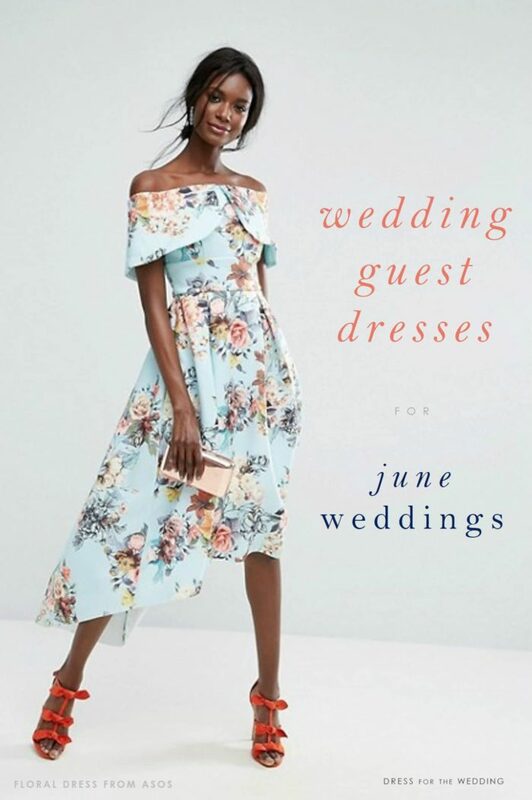 Have fun at the June wedding you’re attending! 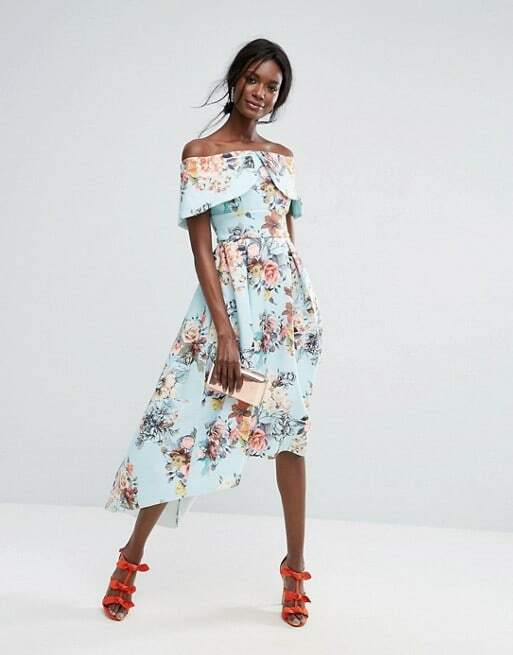 June IS the prime-time wedding season, and we once again have a full post of ideas for what to wear to this month’s weddings. 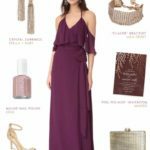 Our styled look above is inspired by a few trends we love for summer 2018, and for wedding guest-wear in general! 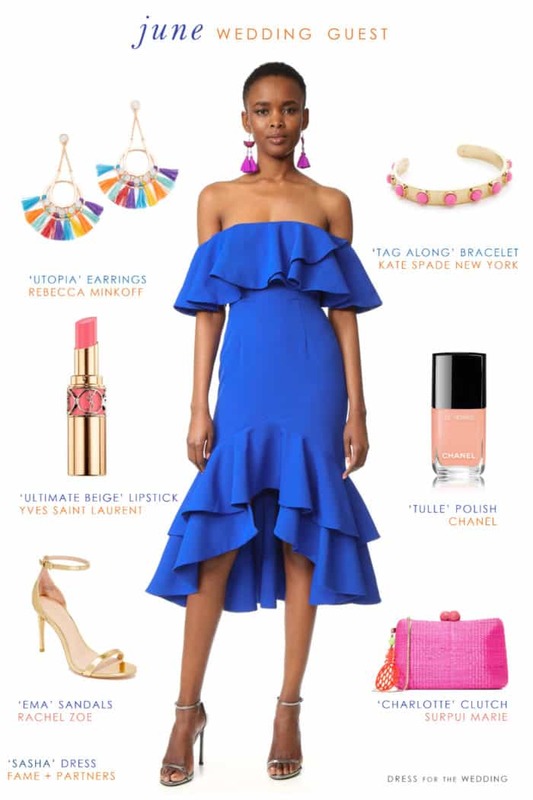 The dresses and styled outfit below blends the best of these hot trends we are seeing this Summer 2018: an off-the-shoulder silhouette, ruffles galore, a chic midi length with hi-low hem, oh-so hot tassel chandelier earrings, and bright punchy colors! 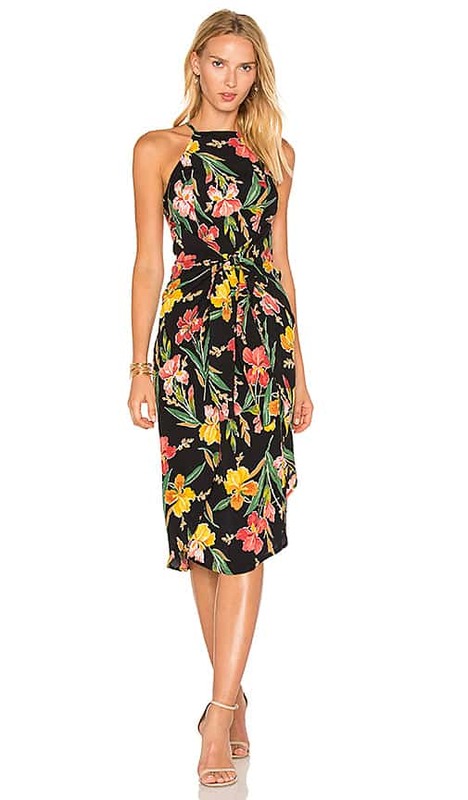 It’s a festive look to ring in summer events in cheerful vibrant hues! 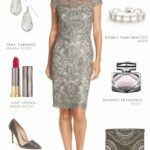 This dress is really versatile for afternoon to evening — perhaps just add some more upscale sparkling accessories for evening – this bright festive look is a bit more daytime! 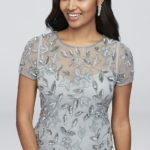 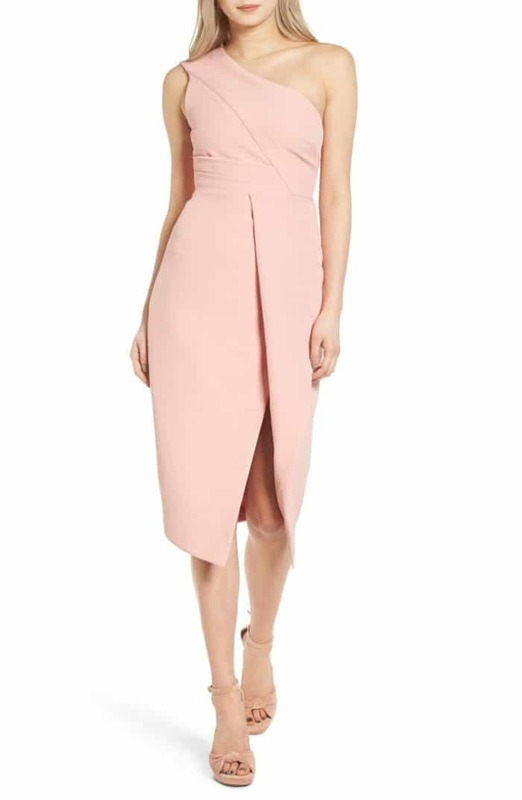 If this dress isn’t quite the one for you or not the right formality for your event, then I have a few more picks for you, in order of dress code! 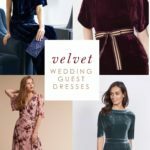 The shopping sources and images for this post about Dresses for June 2017 Wedding Guests uses affiliate links from our sponsoring retailers. 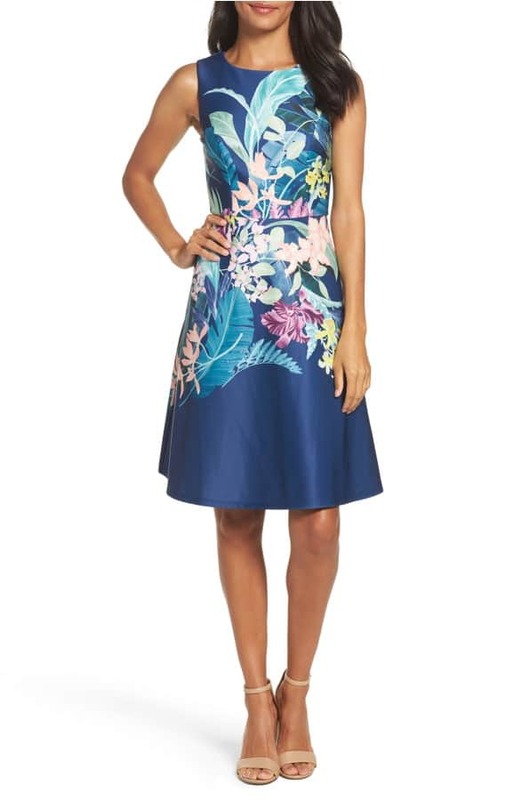 Cocktail attire is the standard for most weddings where the dress code hasn’t been more specifically identified. 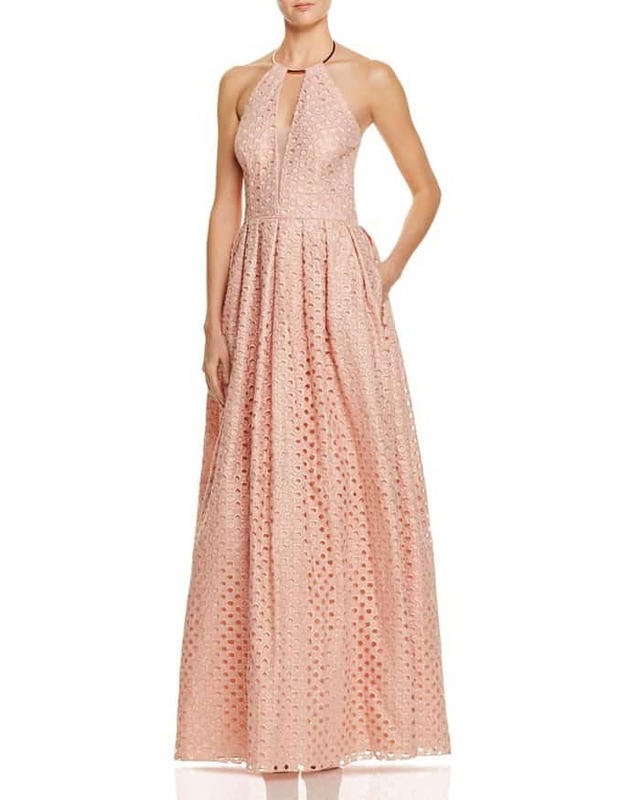 A cute lace or tailored cocktail dress in a spring color will usually be perfectly appropriate for a June wedding! 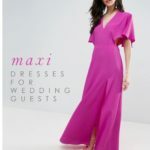 If you think you might need something more formal, or you just prefer a longer length, see the maxi dresses in this next section. 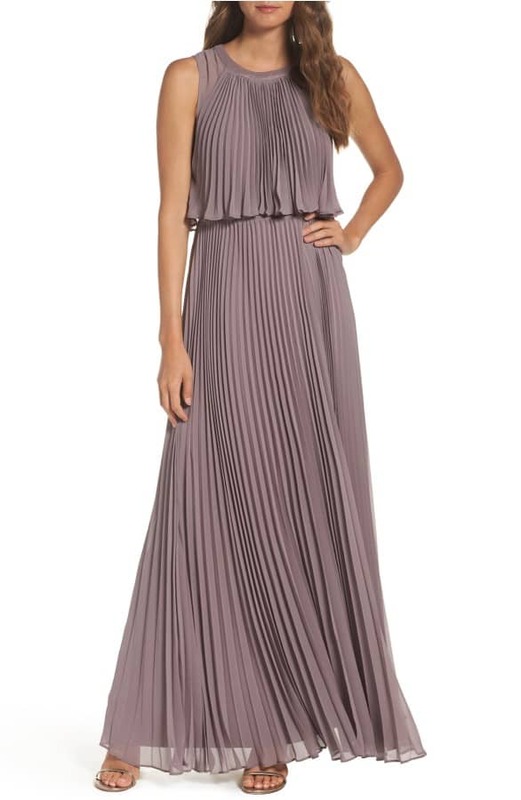 Shopping hint: there are even more in this post dedicated to maxi dresses for weddings! 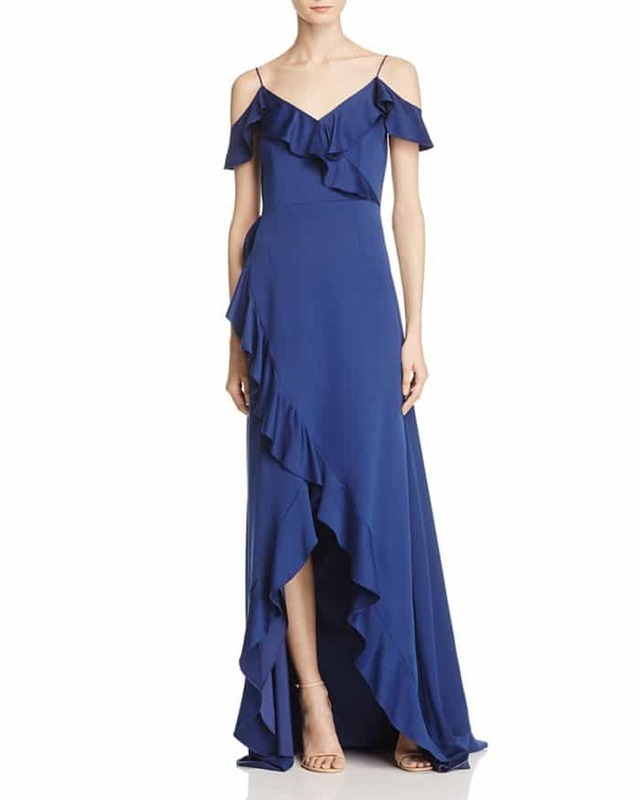 Floor-length gowns are always the most formal looks, but for June summer weddings, it’s fun to pick gowns in rich and cheerful colors and lighter, flowing fabrics. 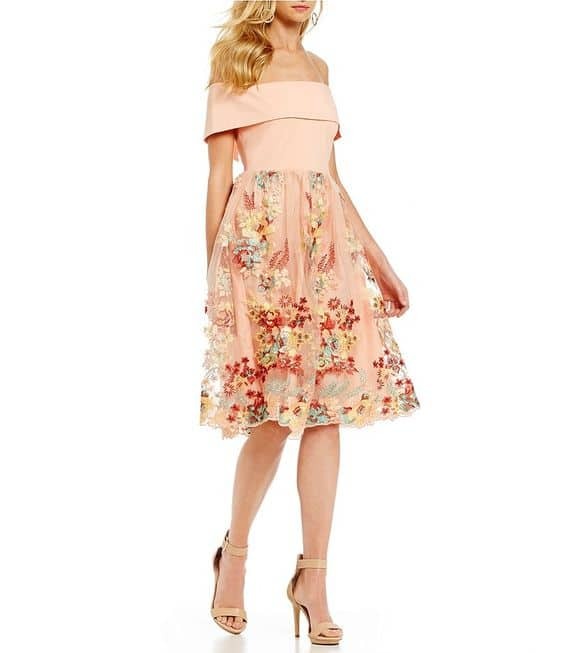 Here are a few gowns for wedding guests we love for June weddings! 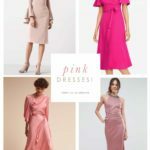 The shop section and links noted in italics use affiliate links, meaning this blog may receive a small commission from retailers if a qualifying purchase is made. 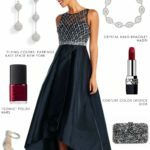 This is at no cost to our readers, and helps us support running this blog!